An estimated 80,000 people who work in Seattle will be getting a raise January 1st as the city continues its long march to a $15 per hour minimum wage. That accounts for nearly 15% of the city’s workforce of 540,000. Even more could see other new benefits surrounding sick leave. The wage increases are only part of the good news for workers. In 2016, Washington voters approved I-1433 expanding mandatory sick leave statewide. Some benefits in the initiative are more generous than those granted under city regulations, explained Karina Bull, of the city’s Office of Labor Standards. Some of the new benefits include allowing people to take sick time to care for children of any age (the old rules only allowed for time to help minor children) and also to help siblings and grandchildren. The waiting period to qualify for paid sick time will be reduced from 180 to 90 days. Caps on the use of sick time will be forbidden. There will no longer be an exemption for employees engaged in a work-study program. In some cases, the Seattle benefits are more generous, and will remain in place. Bull said the City Council will likely soon consider an ordinance to implement the more generous state standards, where appropriate. Reviewing the city’s charts laying out the various changes (PDF) have become an end of the year Seattle small business tradition. Capitol Hill’s Central Co-op hosted Seattle Mayor Ed Murray and a collection of officials and labor representatives Friday to mark the $15 minimum wage milestone in the city. “I feel like this is the starting whistle for a labor movement that has become progressive, that’s fought for works, and that’s fought for the community on issue after issue,” Nicole Grant of the King County Labor Council said during her time at the mic during the small media conference inside the E Madison cooperative. CHS reported earlier on the first wave of Seattle workers to reach the $15 minimum wage mark at large companies with more than 500 employees. With the opening Tavolata on E Pike, Ethan and Angela Stowell brought their Belltown-born, modern Italian fare to Capitol Hill — they also brought a continuing to grow, new way of doing business in Seattle as the city transitions to a $15 minimum wage. “People really love the Uber experience, where you just get out and don’t have to worry about tips,” Angela Stowell tells CHS. According to the influential and prolific restauranteurs, the new, second Tavolata that opened a few weeks back in the Dunn Motors building at 501 E Pike is their first attempt at recreating one of their original restaurants and is the last Capitol Hill restaurant opening for the foreseeable future. Capitol Hill’s Tavolata has been tipless since it opened in late June. Angela Stowell said that almost all Stowell restaurants switched over to a service charge model on June 1. Tavolata joins a small but growing group of tipless bars and restaurants on Capitol Hill. “We kind of waited to see how other people did it,” Stowell said. The plans for Good Citizen, Andrew Friedman’s second Capitol Hill hangout that eased into operation more than a year ago only to quietly go dormant again, have changed. Meanwhile, Liberty, Friedman’s plucky 15th Ave E bar that made its reputation in growing Seattle’s craft cocktail scene out of equal parts integrity and bitters, is up for sale — but likely only available to a very special group of buyers: the people who work there. After opening as an event space more than a year ago, Good Citizen on E Olive Way is, for now, anyhow, moving forward as a cafe — craft cocktail-free. The office responsible for enforcing Seattle’s expanding labor laws needs $6 million in 2017 to cover its operations. On Wednesday, Seattle City Council members will be considering a new fee on businesses to fund it. The owner of Seattle’s most prolific marijuana shop is apologizing after paying several of his employees below Seattle’s minimum wage. Around 10 budtenders at Uncle Ike’s had been getting paid $10 an hour, 50 cents below the city’s minimum wage as of January, according to owner Ian Eisenberg. Eisenberg said it was a simple misunderstanding, but one employee says it took her multiple attempts to rectify the situation. The issue at the 23rd and Union pot shop was first reported on by The Stranger, which revealed a series of text messages budtender Nicole Stotts had with a payroll manager. The manager, contracted by Uncle Ikes, erroneously told the the employee that her tips counted towards her wage. Capitol Hill’s tipless bars and restaurants settle in — more to come? 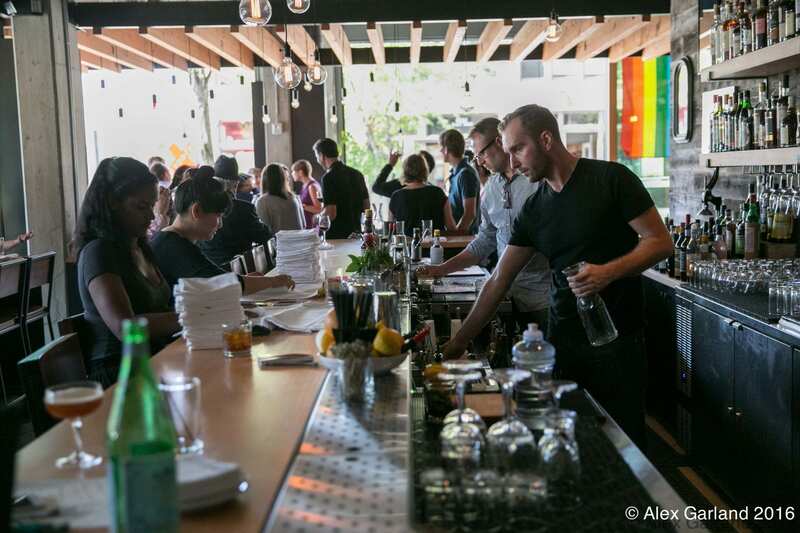 Slowly but surely, the concept of a tipless restaurant is gaining a foothold on Capitol Hill. It has been a year since Lionhead and the Renee Erickson trio of Bateau, Bar Mesuline, and General Porpoise ditched tips in favor of a service charge and flat hourly wages for their staff. Several of Seattle’s high profile restauranteurs have followed suit while others on Capitol Hill say they are exploring the model. Some have cited Seattle’s $15 minimum wage law and concerns over a decrease in tipping as their rationale for the move. Capitol Hill owners who spoke with CHS said they were primarily motivated by offering more stability for their staff. At the Sea Creatures trio at 10th and Union, owners said ditching tips was relatively seamless and popular among servers. “Going tipless has actually helped us to attract the types of people we like to work with, namely professional servers and cooks,” said Jeremy Price, co-owner and operations manager of the Erickson parent company. As part of the tip phase out, Price promised employees that overall take-home pay would not decrease. “Front of house staff is making the same as they were before. The back of house has seen an average 15 percent pay increase,” he said. Thanks to a small 2015 blip in the Capitol Hill pizza economy, the relatively high profit margin, relatively easy to produce culinary creation has become a $15 minimum wage talking point. We’re not sure where this fits into the conversation other than, yup, pizza remains hot on Capitol Hill. Pagliacci Pizza just opened a new slice bar at their Miller store and to celebrate the location will give away slices on Saturday, May 14th, from 11 a.m. to 3 p.m. There is a limit of two slices per person. In addition to adding a slice bar and an expanded dining room the store now serves beer and wine. Doors open daily at 11 a.m. The 10th and E Miller location had been a delivery-only kitchen since opening in 1992. According to Pagliacci, the company planned the location as its first deliver-only site but delays ended up costing it its place in Pagliacci history. “The space seemed so big that we agreed to rent out the front to a former employee who wanted to open a cafe,” the store’s information page reads. “The former employee got cold feet (about the cafe) and over time, we found we definitely needed the space to meet the high volume of orders in Capitol Hill.” Pagliacci’s first call center was operated at the location before Pagliacci Support Central was consolidated at the company’s E Pike headquarters. CHS wrote here in 2013 about Pagliacci’s 30 years on Broadway and the company’s E Pike mission control center. Pagliacci says it plans to open its 26th location around Seattle by the end of the year. Meanwhile, CHS has reported about other Hill pizza veterans joining the wave of young bucks bringing more pizza than ever before to Capitol Hill’s food and drink offerings. With its upgrades, Pagliacci now pulls North Capitol Hill into the 2016 pizza wars. Your move, Padrino’s.